Minimizing the acoustic signature of a ship in the environment of anti-submarine warfare is essential to the preservation of submarine and minesweeper safety. The ONMS system allows own noise measurement and automatically provides an estimation of the noise radiated to the exterior. Know the noise levels radiated to water with accuracy. The system includes a function that estimates the levels of noise radiated to the water by the effect of own noise accurately, allowing detection and counter-detection distances to be established with greater accuracy and, in short, to better evaluate the risks and make better decisions in accordance with the real environmental conditions. Ensure the operational discretion of the vessel. Using mathematical models, our engineers will evaluate the best location for the sensors on the submarine or the minehunter: accelerometers and hydrophones (only for submarines) to be strategically placed so that every possible source of vibration and noise is detected. The signal from each of these sensors is automatically analysed in real-time and if these exceed certain pre-established thresholds, will generate an alert indicating the origin of the noise and an estimation of the noise being emitted to the water. In the case of submarines, it also generates alerts in the event of cavitation. Increasing the detection capacity of the vessel’s sonars. The system allows the operator to send its own detected frequencies to the combat system so that they are not taken into account as detections by the rest of the ship’s sonars. This avoids the interference that any detected self-noise can cause. This system is an efficient application for controlling the acoustic signature. It uses tools which allow for comparison of the factory configuration with the noise and vibrations detected in real-time. 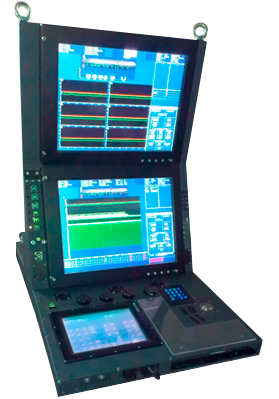 It allows each sensor’s signal to be analysed separately so that the operator can evaluate the vessel’s noise sources (machines, propellers, etc. ), the reverberations transmitted from the structure and to monitor their status. Broadband, narrowband and DEMON analyses can be performed. It can also check the mechanical condition of the machinery, predict potential breakdowns and evaluate the efficiency of its insulation. • Continuous monitoring of the sensors to detect noise sources. • Estimates the noise radiated to the water as a result of own noise. • Broadband, Narrowband and DEMON analysis. • Noise recording and database for comparison. • Adaptable to different types of submarines, minesweepers and other surface vessels. • Easy integration with the ship or submarine’s combat system. It can also be installed on a dedicated console. • Meets the most stringent shock, vibration, environmental and EMI/EMC standards. ONMS is in service on board the submarines and minesweepers of the Spanish Navy.